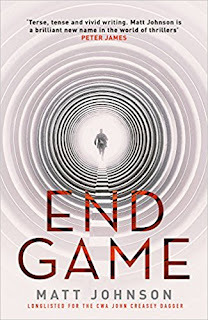 End Game is the final book in the Robert Finlay trilogy. 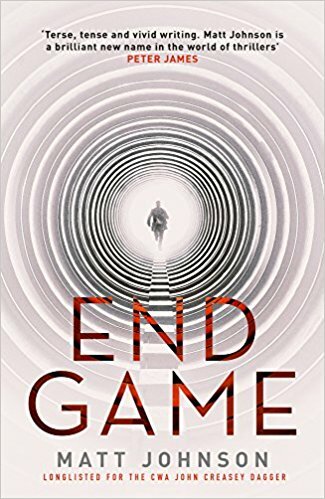 As in Wicked Game, the first book in the trilogy, Matt Johnson weaves his way with consummate ease around the dastardly and complicated intrigues that flourish within and between the security and police forces. Needless to say, these in-house machinations do nothing to make the lives our hero, Inspector Robert Finlay, and his old friend from their army days, PC Kevin Jones, any easier. Being persecuted by Superintendent Mellor from CIB - the Met’s internal anti-corruption squad - who is determine to crucify Finlay and Jones for virtually any crime that pops up whether or not they have committed it, and hounded by rogue officers in MI6 who are on a mission to eliminate them regardless of explicit orders to the contrary, are only a part of the two men’s everyday struggle to survive. Thankfully there are others within the police force, MI5, and old army friends who do their best to help by untangling the truth. At the heart of this book is a manuscript called The Al Anfal document. We are told that this incredibly valuable document contains descriptions of the methods and philosophy of an organization that seeks to co-ordinate the activities of extremist groups in the Middle East. Copies of Al Anfal are few and far between and, for a variety of very different reasons, everybody wants to get their hands on a copy. Up until now everybody - bar Finlay and Jones -who has either seen it, has knowledge of it, or wished to publish anything about it, has been ruthlessly hunted down and killed. The quest to obtain a copy of Al Anfal becomes quite literally a race to the death, or the End Game, for Finlay and Jones. Will they survive? The odds are certainly against them. Once again Matt Johnson has produced a stunning story that makes an absolutely compelling read. You just can’t put it down. Words and phrases like fast-paced, authentic, gripping, tense, comradely loyalty and action-packed all spring to mind, and deservedly so. But to my mind what makes this book stand head and shoulders above many others in the genre is the genuine humanity of the characters who people it. Finlay and his comrades are real people with real families, not Teflon coated improbable heroes whom you know are going to survive no matter what happens to them. Simply excellent. Matt Johnson served as a soldier and Metropolitan Police officer for twenty-five years. Blown off his feet at the London Baltic Exchange bombing in 1993, he was one of the first police officers on the scene of the 1982 Regent’s Park bombing. Matt was also at the Libyan People’s Bureau shooting in 1984 where he escorted his mortally wounded friend and colleague, Yvonne Fletcher, to hospital. Hidden wounds took their toll. In 1999, Matt was discharged from the police with Post Traumatic Stress Disorder. Whilst undergoing treatment, he was encouraged by his counsellor to write about his career and his experience of murders, shootings and terrorism. One evening, Matt sat at his computer and started to weave these notes into a work of fiction that he described as having a tremendously cathartic effect on his own condition. He has used his detailed knowledge and memory to create a fast paced, exciting and authentic tale of modern day policing. Matt Johnson is living proof that PTSD is a condition that can be controlled and overcome with the right help and support. He has been described by many fans as an inspiration to fellow sufferers.